Thanks to some hard work, I’ve managed to restore most of what I lost when my browser crashed on me. Maybe it’s even a little better. Now I have a couple of backups. Duh. Onward NaNoWriMo! or NaNoWriMo Ho! Now there’s yardwork to do. For anyone who didn’t know, today marks the beginning of NaNoWriMo, or National Novel Writing Month. The idea is to write 50.000 words during the month of November. My former professor and member of my personal pantheon of interesting minds, Roger Lathbury, did it a couple of years ago. But what about this, then? To actually write 50,000 words in 30 days? Let’s break that down: it’s about 1700 words a day. Can I do it? Sure, I can write 1700 words a day. I grew up in the Washington, DC area and in the first 20-something years of my life, I don’t remember the power going out. I vaguely remember it going out once—but I may be just giving Mother Nature the benefit of the doubt. But then also, in those days when the most sophisticated electronics I had were a transister radio, and later, a stereo system, a TV, and a Smith-Corona typewriter, we weren’t as dependent on electricity, so maybe it wasn’t that big of a deal. Then again, I’ve always been dependent on food, and I grew up with an electric stove. So…. As my nifty little wireless Brother laser printer churns out pages behind me, in preparation for a video I’m making on making my own books (stay tuned), and the massive hurricane Sandy makes its way up the coast to turn off my power, knock down my neighbors’ trees, wreak celestial havoc, and generally maybe just eat the East Coast, I just wanted to get in a post on great new stuff from Poets & Writers magazine, where, back in the days when I was working in publishing, I once applied for a job, and which, also many years ago, ran a piece of mine on simultaneous submissions. Many years ago, I went through a state of Salinger addiction. Anyone who has ever been a fan of the late stylist at an impressionable age likely goes through something like that with reading Salinger. His sentences are just so good. Can’t say I much re-read him these days, but there’s a moment in one of the Glass family books when he offers some really good writing advice. The writer of the stories is allegedly Buddy Glass. His older brother, Seymour, is a saint too good for this world. In (I think) a note to Buddy about one of his early stories, Seymour (I’m paraphrasing, here) tells Buddy something to the effect that he’s trying too hard. He tells him that he was a reader long before he was a writer, and so he should write that thing that he most wants to read. I think it’s exceptionally good advice, and I got similar advice from my professors over the years. I remember going to Richard Bausch, one of the earliest of my teachers, who (unbelievably) may have been unpublished at the time and asking how to end a story. At the time I was maybe 18 or 19 and wanted to write more than I knew what it was I wanted to write about. The real problem was that I had no idea how to set up a conflict so that it could be resolved. (I was kind of hooked on Kerouac at the time, and just wrote, figuring that by doing so, I’d get something worthwhile. He said something like read other writers. See how they end stories. I also needed to see how they began them, but the real point was reading. Writing Fiction: A Guide to Narrative Craft), and stood hopefully in front of the class and asked what these hopeful young writers were reading. Few of them actually were, aside from the books they were assigned to read for their other classes. I won’t say that I was shocked but I sure as heck was chagrinned. But the reality is that a whole lot of folks who take undergrad creative writing courses just plain aren’t interested in the idiotic life that being a fiction writer can be. They just needed an agreeable elective. Read poetry. One of my professors when I was an undergrad, Peter Klappert, said something to the effect that fiction writers ought to read poetry, and lots of it, to get the latest news on what language can do. I could not agree more. Of TFAOAFGND, and I think they look pretty good. But so I’m reading the first page, and thinking this is a killer first page, and then get down a few grafs and see, crap, a freaking typo. But this is what advance copies are for, or one of the things. It’s a curious thing, a physical copy of a book that is going to be an ebook — all the heft you’d expect from a book that will, when it is finally published have no heft. If you’re a reviewer or tastemaker, thought-leader, or just a general bon vivant (you must have evidence of status as bon vivant), shoot Margaret an email at margaret@shelfmediagroup.com and request a copy. You might get lucky. genre was treated as almost a different industry from literary fiction, ignored by critics, sneered at by literary writers, relegated by publishers to imprint ghettos. But the dirty little and not-particularly-well-kept secret was that, thanks to the loyalty of their fans and the relatively rapid production of their authors, these genre books were the ones who kept the entire operation in business. All those snobbish literary writers had better have hoped like hell that their publishers had enough genre moneymakers in house to finance the advance for their latest beautifully rendered and experimentally structured observation of upper class angst. Seems to me that her somewhat ironic and overstated take is accurate. I don’t think it’s entirely new that “mainstream” literary writers are “shifting” into genre (and neither does Wright). I kind of think all of this is sort of coincidental. 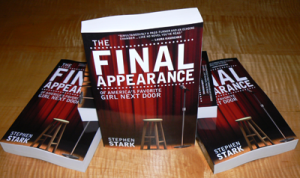 In my own case with my new novel, THE FINAL APPEARANCE OF AMERICA’S FAVORITE GIRL NEXT DOOR, I could not have told the story I wanted to tell without a bit of genre-bending. The funny (to me) think about all of this is that we’d totally accept such excursions if we saw them in the movies, but it is somehow a Problem in selling a novel. To me, this seems just another way that mainstream (i.e., not indie) publishing has chased itself So far up a very tall tree that it’s no longer very easy to see the ground.